The Art Department is proud to present "Heart’s Delight: Recent Paintings by Rachel Lazo" at the Cañada College Art Gallery, Building 9, Room 152. The show runs from through December 12. Gallery hours are Mon. - Thur., 9am - 2pm. 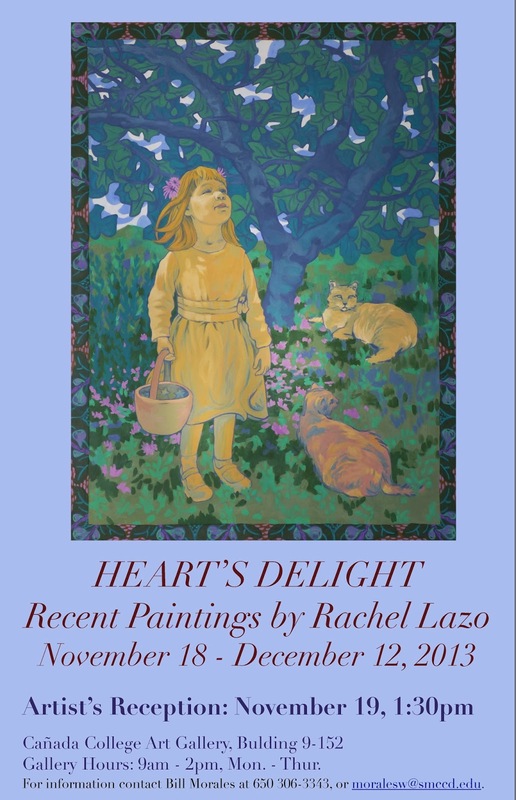 Lazo’s recent body of work entitled “Heart’s Delight” explores the link between family and place. The rolling hills south of Gilroy, the fig tree in her back yard, and her uncle’s mowed lawn in suburban Los Angeles shape the activity and interaction of family members. At the core of these paintings is the idea that the natural world shapes our relationships and is an intrinsic part of who we are. Her color usage was inspired by the paintings and murals of Les Nabis, a group of French 19th Century decorative painters associated with the Arts and Crafts Movement. Les Nabis were interested in creating paintings that would provide a respite from the chaos of modern-day life. Their paintings depicted figures in landscapes, and the images were stylized and abstracted to elicit a serene and contemplative state of mind. Maurice Denis and Édouard Vuillard, in particular, used tonalities of color with little value contrast to create a dream-like effect in their paintings. Exploring color interaction, composition, texture and pattern, Rachel’s paintings are meant to inspire contemplation of family, engagement in nature, and the unbridled happiness of childhood memories. Lazo is full-time faculty at Evergreen Valley College in San Jose. She lives in San Jose with her husband and 4-year-old daughter, where her husband grows a vegetable garden and orchard, and where her daughter frolics for hours outdoors. For more information contact Bill Morales, 306-3343, moralesw@smccd.edu.